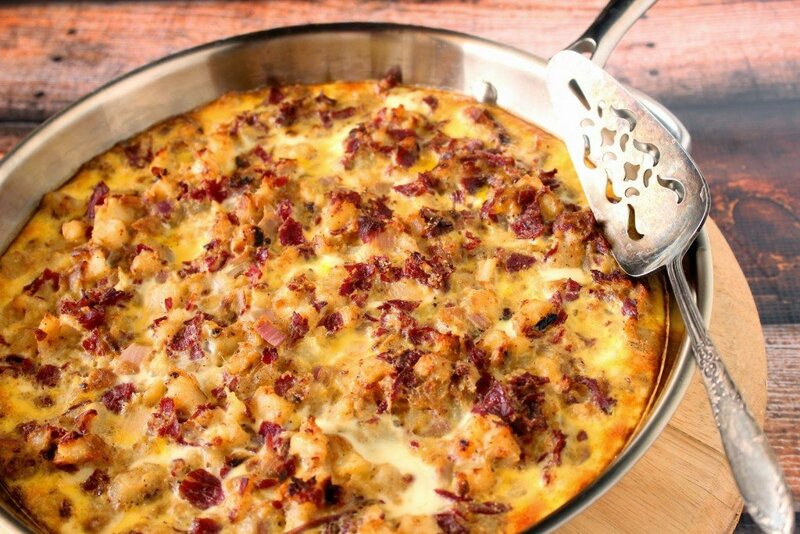 When you have a taste for corned beef hash, but also a wonderfully eggy frittata, why not make this unexpected yet delicious Corned Beef Hash Frittata? It will satisfy everyone at the breakfast, lunch, and even dinner table. Making a corned beef hash with a few fried eggs on top had been on my mind for weeks and weeks. Which is why, naturally…(NOT), my completed dish turned out nothing like what I originally had in mind. Enter my Corned Beef Hash Frittata. 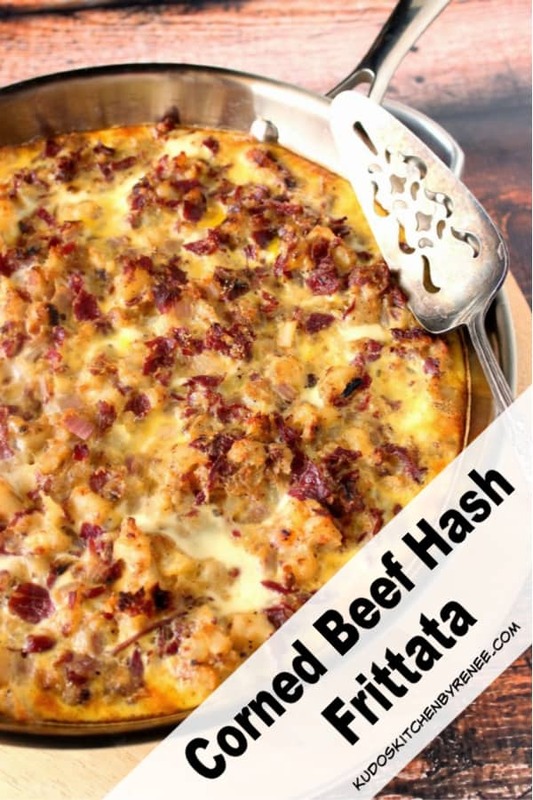 **Please Note – The printable recipe card with detailed instructions, complete ingredient measurements, and nutritional information for making Corned Beef Hash Frittata is available near the end of this post. Turn your leftover corned beef into something amazing! 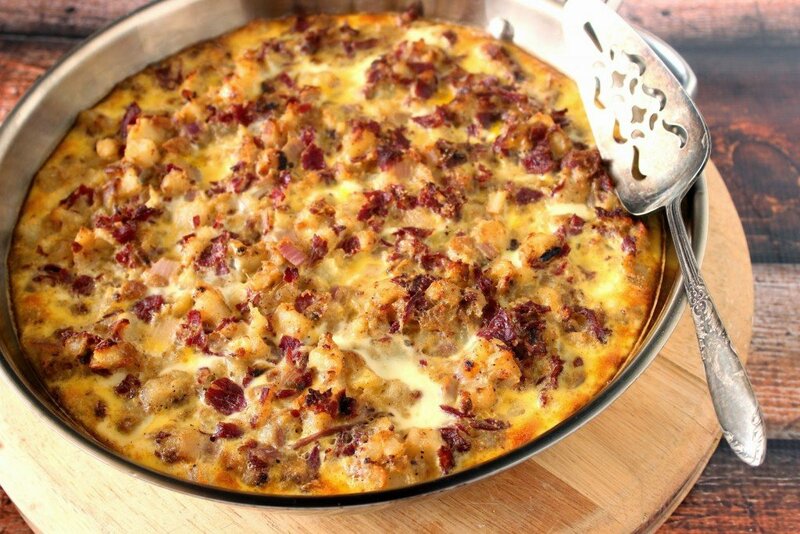 Corned Beef Hash Frittata is super easy to make because it takes advantage of frozen hash brown potatoes and deli counter corned beef, or even better…leftover corned beef (if you’re lucky enough to have any)! Once it assembled all you need to do is pop it in the oven (using the exact same skillet), and then go about your business until the eggs are cooked through, nicely browned, and the house smells amazing! You can serve this Corned Beef Hash Frittata for breakfast, brunch, lunch or dinner. If you’re having it for dinner, serve it alongside this Healthy Berry Salad or maybe a delicious Heirloom Tomato Salad. If you want to make this Corned Beef Hash Frittata more of a complete meal, feel free to add some of your favorite veggies into the mix before you add the eggs. You can either use fresh or frozen but if you use frozen make sure to thaw them first, just as you did the potatoes. If you like cheese (and who doesn’t), bake the frittata for 50 minutes, remove it from the oven, top with your favorite grated cheese and then continue baking for the last 10 minutes to melt, and brown the cheese. Below is the printable recipe card for today’s Corned Beef Hash Frittata. In a large, oven-safe skillet, saute the onion in the butter for approximately 3-5 minutes, stirring occasionally. Add the olive oil to the skillet along with the hash brown potatoes. Cook, stirring only occasionally until the potatoes have browned. Stir in the corned beef, 1 teaspoon salt, ½ teaspoon pepper, thyme, garlic powder, dry mustard, and cayenne. Meanwhile, in a large bowl, whisk the eggs, milk, the remaining salt, and pepper. Pour the egg mixture over the corned beef hash. Carefully slide the skillet into the preheated oven and cook for 60 minutes, or until the eggs are set in the middle and the frittata is golden brown. Remove. Cool slightly. Cut into wedges, and serve. I hope you’ve enjoyed this recipe for my Corned Beef Hash Frittata as much as I’ve enjoyed bringing it to you. Should you have any questions regarding this, or anything else you see on my site, please don’t hesitate to contact me directly, or leave me a comment in the comment section below. It is always my distinct pleasure to get back to you with a reply just as soon as I possibly can! Love this Renee! I'm going to try making it this weekend. You continue to inspire me. I love to hear that I inspire you! That is probably the best comment EVER!!! Thank you! We hardly ever have leftover corned beef from St. Patrick’s Day, either. Deli corned beef is always a great option for this dish. This was the perfect recipe for my leftover corned beef! SO delicious!